More often than not, St. Valentine’s Day has the tendency to be overdone commercially, but there is one thing right about it – love can come in the color red. 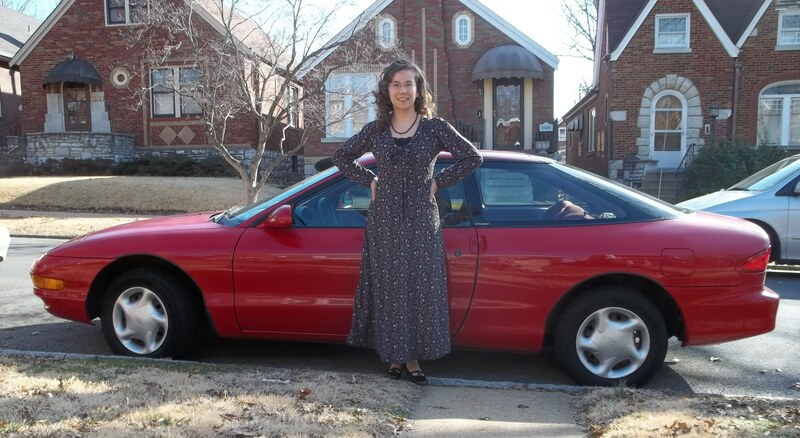 Just to show you this fact, I’d like to show you 4 of my favorite reds; 1) a tie neck knit dress, 2) a heart mini apron, 3) a re-fashioned dress, and 4) my streamlined beauty of a car, a Ford Probe. This tie neck knit dress was the easiest sewing project I have done in quite awhile, and I really feel so comfortable and dressy in it. 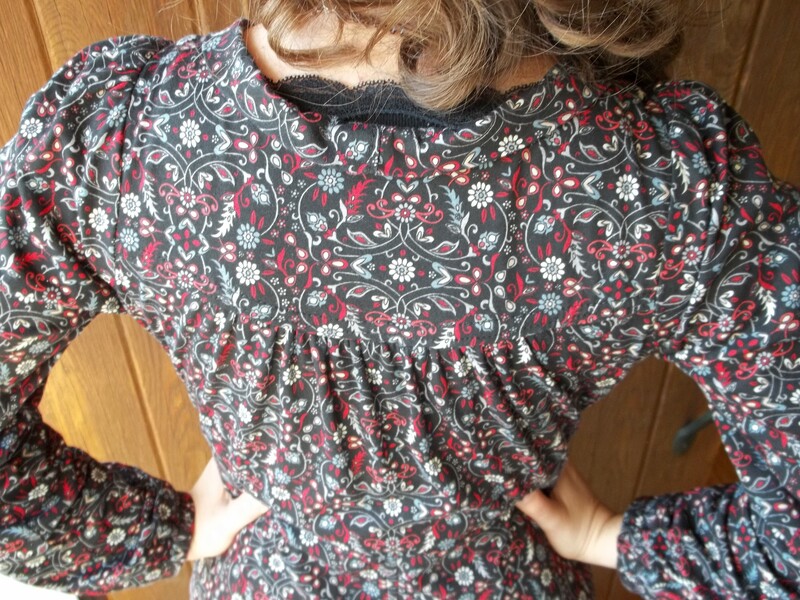 I covered my behind (to use a phrase) before starting this pattern, Butterick 5794, by checking PatternReview.com, finding most comments saying view C and D run quite big. Pattern review was the only guide I had to go by, since the pattern pieces were completely devoid of any finished measurements, any ease info, or anything to let someone know ahead of time how it would fit. Very strange, indeed! 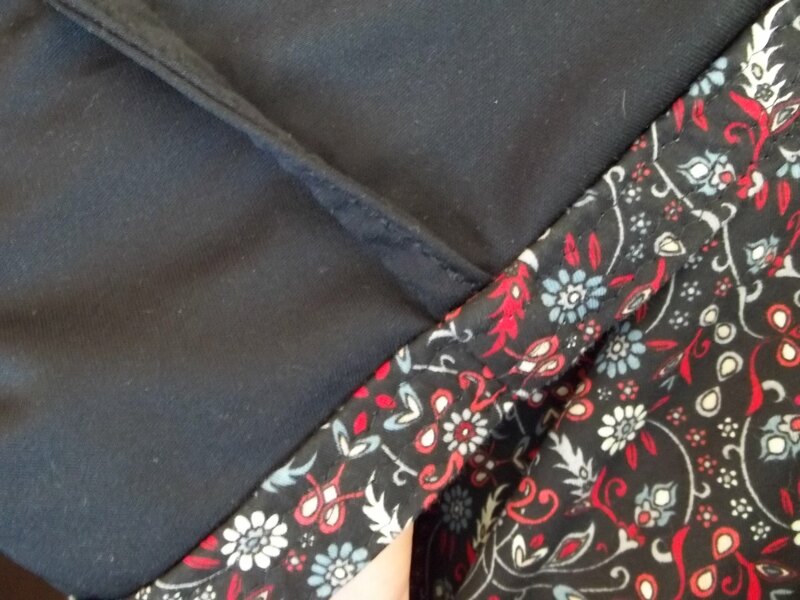 However, I merely cut a half size smaller than I normally wear and made big seam allowances (about 1 in.) and I had, for once, a dress that fit as finished, with no lengthy adjustments or alterations. There were only some minor changes I made to this pattern for my dress. The tie neckline goes together very well, but there is a gap of a few inches that ends up between the ties in the center front of the neckline. Being small chested and considering the neckline to already be generous, I sewed a very cute, but small, inverted pleat out of those front inches between the ties. This brought the ties together in front (making them easier to form a bow) and prevents the neck from gaping open. 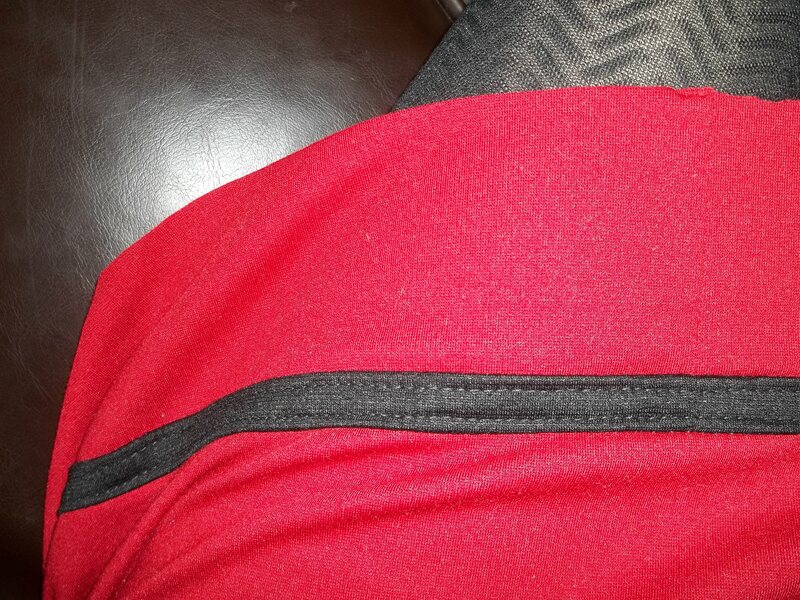 Also, I did not like the pattern’s self casing idea for the bottom of the sleeves. Folding the sleeve ends under to make a casing for elastic doesn’t give the sleeve extra room to ‘bubble’ out like the drawing shows. To fix this, I merely cut 2 rectangles, sewed them on as separate 5/8 in sleeve casings, running 1/2 in. elastic through, and hand sewing them closed. Doing the sleeve casings works out much better for achieving the cover drawing’s look. The back gathering detail of this dress really makes this dress look neat and special even from behind. Otherwise most of the details would be concentrated in the front view. Front and back together make this a very flattering dress. Maybe in my close-up at left you can now see the red in the print. The fabric’s design also includes a dusty blue, and some white, but, besides the black and red background, the scroll work is scattered everywhere. The printed cotton knit of my dress is lined in a black jersey knit both for substance and also to hide its white underside. The print and the finished weight of this dress makes it a perfect multi-season clothing item. I wore it for these pictures with a tank under for warmth, but worn alone and with the sleeves pulled up, I expect to get more use out of my tie neck dress in the warmer spring and fall days. Posing with my red Probe for these pictures was supposed to bring out the red in my dress, but whether it worked or not, my car always brings a smile to my face…and that’s always a good thing, right!?! My ‘Mustang wanna-be’ car is such a minimalist when it comes to causing problems, it always is great, much like how my tie neck dress was to sew and put together. 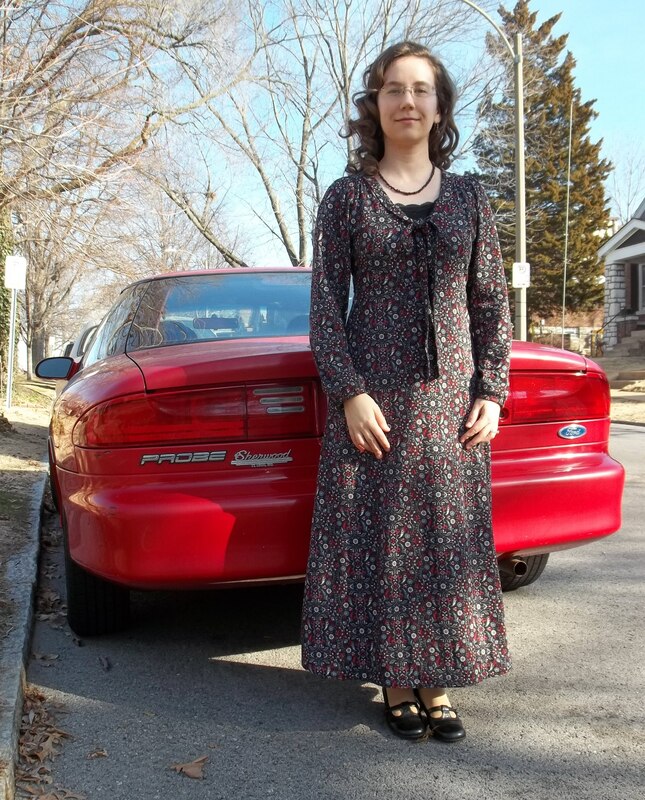 But, unlike my dress, my Probe frequently brings out the Speed Racer in me, the way she jumps forward in a burst a power when I shift up gears and let go of the clutch. I thought about doing a “Back to the Future” pose just for fun, but as much as I’d LOVE to talk about my car (having only 60K miles for being a ’93, handling turns so well, etc.) I will keep to sewing for now. Then I will pop up my Probe’s eye lights and go flying along a lonesome curvy highway somewhere! 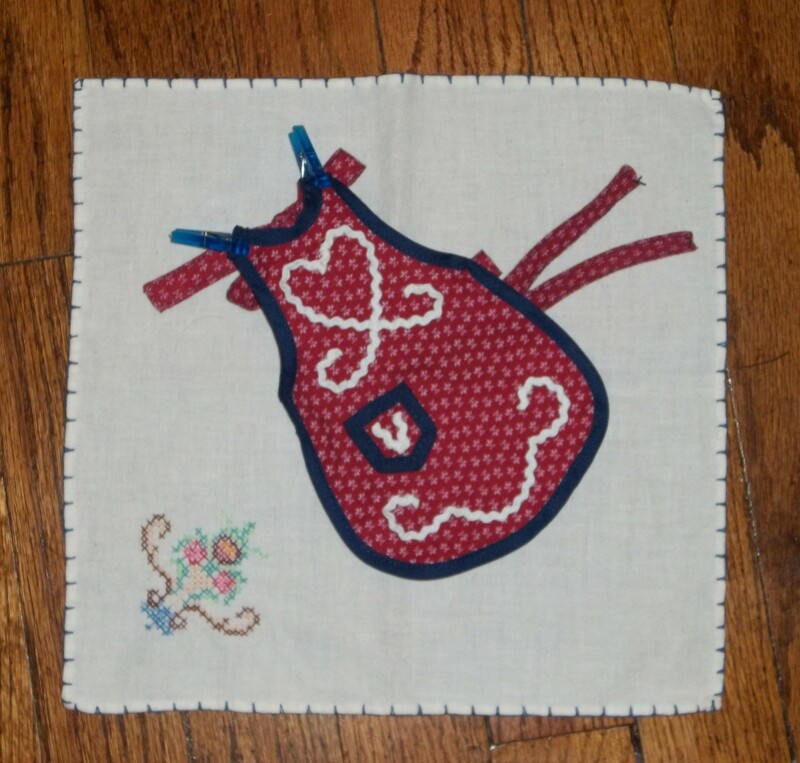 Now I will show you my #2 red item…my patriotic/Valentines mini apron. It is view C of my much used Simplicity 2748 pattern, with different styles made for this post and this post. Even though it is pretty basic with just the front, the pocket, and the four ties to make, it was time consuming on account of the rick-rack and the pocket being sewn solely by hand stitching. This is my only mini apron that was not made from scraps of previous projects. I really do not feel guilty though because I bought the quilting quarter at a cheap price, and plan on using the leftovers for a purse. I don’t know if you can see it, but I picked out this fabric all on account of the tiny Fleur-di-lis in white across the red. Anything with Fleur-di-lis is hard for me to pass up! 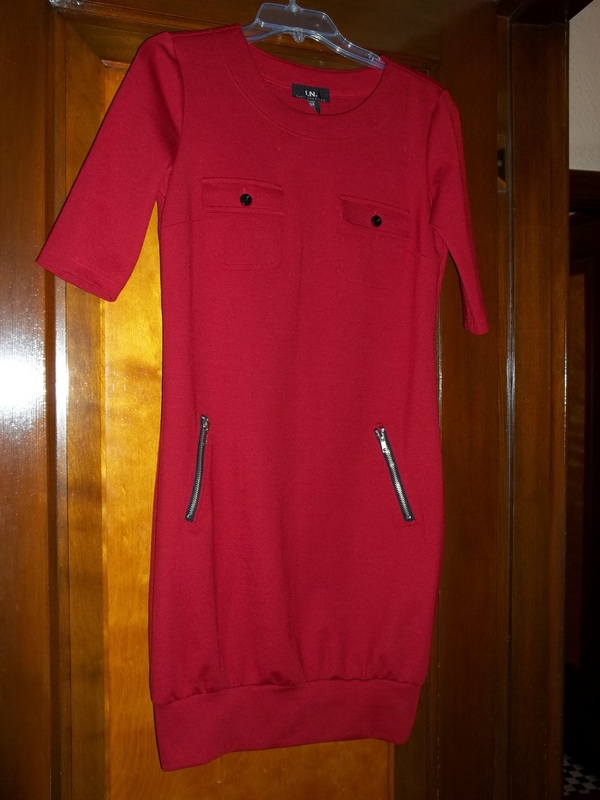 Now to #3, my refashioned modern dress. 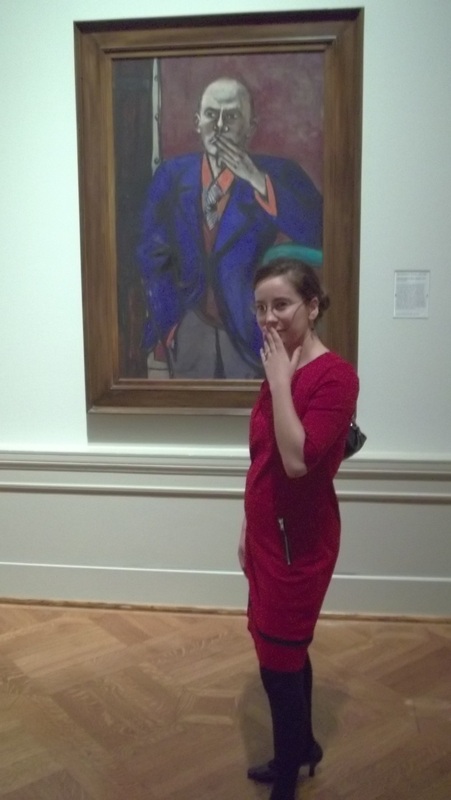 The way we figured it, a modern dress needed modern art. I picked out this red knit number at a local upscale resale shop a few months before baby came as a ‘goal’, something to fit back into. The whole dress fits very well, but the original bottom of it was this silly tight band with the bottom gathered around it to make a ‘bubble’ look which was plain weird. I cut the tight band off the bottom, undid the gathers, and made a plain band instead. I really was hoping to lengthen the dress a bit and add some interest so I made strips of black ponte knit, leftover from this refashion, to sew between the dress hem and bottom band. Not too big of a refashion, but I think what I did was a good save, and I really like wearing the results. At left is a pic of the original ‘before’ dress. Just a few FYI tidbits before I end this post with my The Facts. 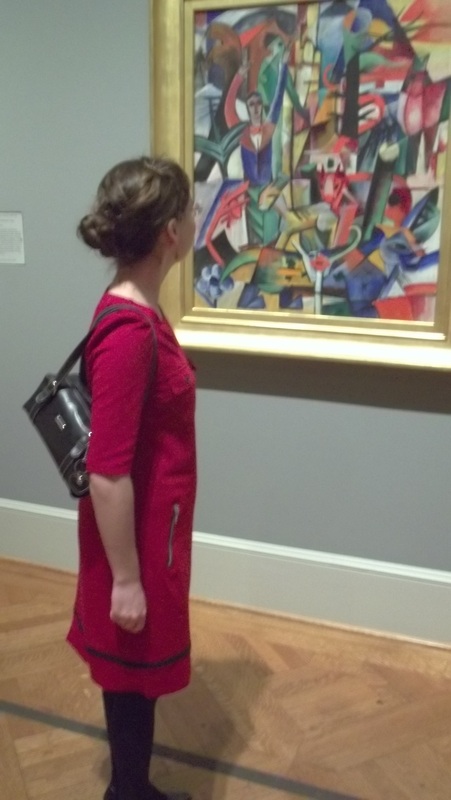 The modern painting in the picture with my back to the camera is “Bucolic Landscape”, 1913, painted by Heinrich Campendonk, while the second painting is a self-portrait of Max Beckmann, painted 1950. Pretty neat, right? I owe the title of my post to the music the CD “Big, Bad World” by the Plain White T’s. I listened to their music while doing my tie-neck dress, with the “1-2-3-4, I Love You” song as my and My husband’s favorite. Please click here to watch the Plain White T’s perform the song live on Jay Leno’s show. “1-2-3-4” is so relaxing, happy, and the lyrics are very sweet and loving. 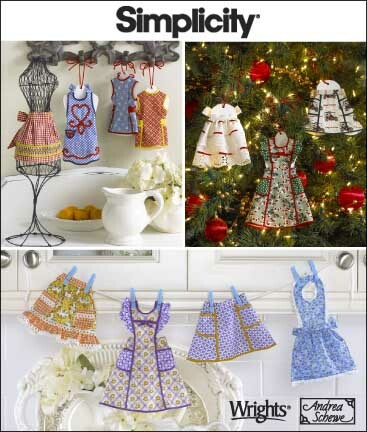 This entry was posted in Modern and tagged "Butterick pattern", "mini apron", "Simplicity 2748", "Simplicity pattern", bow neck, Butterick 5794, dress, floral, flowered, Ford Probe, knit, re-fashion by kellycb. Bookmark the permalink.